Starting their season on the road the Devils came into Florida boasting a six goal performance in Philadelphia. Coach Pete Deboer chose to stick with the same lineup as the previous game. With Schneider in goal and a defensive corps that sported a trio of young talent, the Devils hoped to have better results than the four goals against Thursday night. A year after both goalies were traded, Schneider and Luongo were set to meet in the second game for both teams. 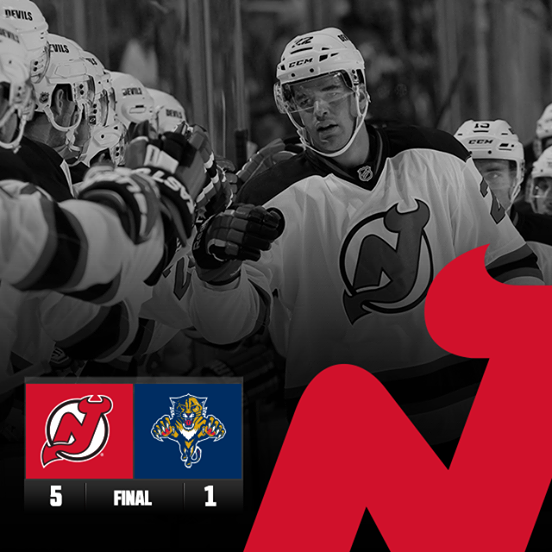 The Devils came right out and picked up where they left off on Thursday night in Philadelphia. Tuomo Ruutu scored early on with a deflection of Eric Gelinas wrist shot. Ruutu’s first goal of the year came at 2:37 of the first period from Gelinas and Merrill. The Devils took advantage shortly after when Marty Havlat also deflected an Eric Gelinas wrist shot to put the Devils up 2-0. Havlat’s first of the year was assisted by Gelinas and Elias at 8:46. After a goaltending interference call on Huberdeau, the Devils took advantage of the power play for a second time in the first taking a 3-0 lead. Mike Cammalleri scored his 3rd goal of the season, assisted by Zidlicky and Severson at 13:13. As the first period wound down, Damon Severson found himself with the puck on his stick after a defensive zone turnover. Severson would net his first NHL goal at 19:32 of the first, unassisted. At the end of one period, the Devils held a 4-0 lead over the Panthers and led 11-9 in shots on goal. The Devils came out for the second a man down after Tuomo Ruutu was called for roughing at the end of the first. After killing the penalty off, New Jersey scored 59 seconds later. Ryane Clowe tallied his first goal of the year at 2:59 from Ryder and Henrique. Having taken a 6th penalty on the night, New Jersey was playing with fire. Schneider lost his shutout when the Panthers scored a power play goal at 16:31. MacKenzie scored his first goal of the year, assisted by Upshall and Campbell. The Devils took a 5-1 lead into the second intermission and led the second period 8-7 in SOG. New Jersey came out in the third period a man down from a highsticking penalty by Gionta in the second. Before they could kill that penalty off, John Merrill was called for boarding at 3:22 of the third causing a 5 on 3 advantage. The Devils would kill off both penalties and not allow a goal even after being a man short for the first 5:22 of the period. The Devils controlled the rest of the period and held on to the 5-1 lead as Schneider made total of 28 saves on 29 shots. With the first two games in the books the Devils look like an offensive juggernaut. Now before we all get too ahead of ourselves let’s wait and see how the offense does against Bishop and the Lightning on Tuesday. With that being said, the Devils tied their record for most goals in their first two games. The third line seems to be clicking well and Michael Ryder seems to have come out blazing hot. 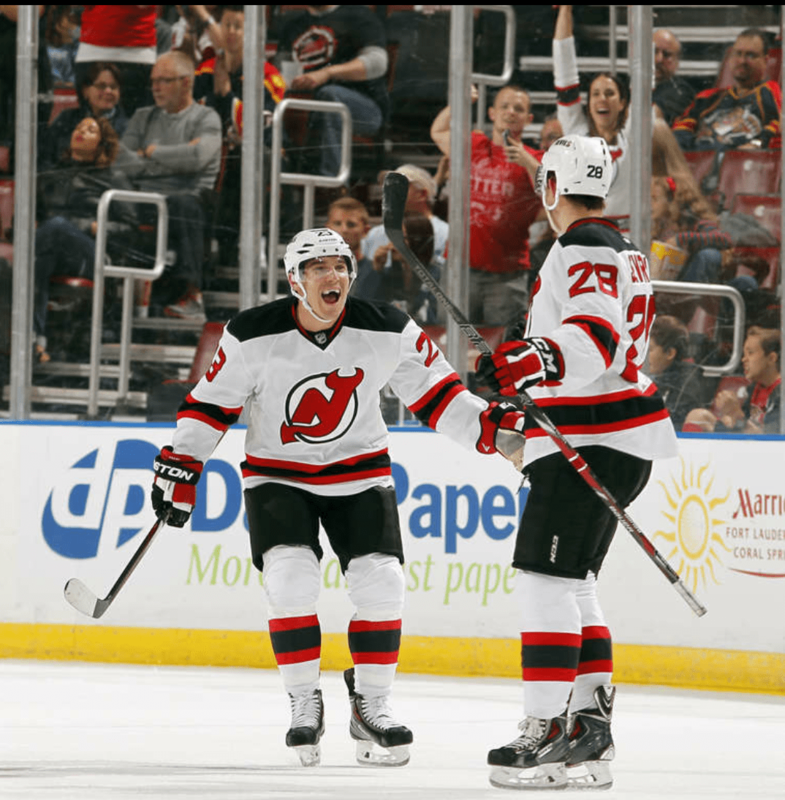 Mike Cammalleri also seems very comfortable in NJ scoring three goals in his first two games as a Devil. After blowing a 3-0 lead in Philadelphia on Thursday the Devils young defense and Schneider tightened up tonight against a team they should be beating by a large margin. If everything stays on the path they seem to be going down the Devils are a lock to make the playoffs. But like I said let’s take a step back and realize this was only game two of eighty-two. But hey… let’s enjoy it for now.